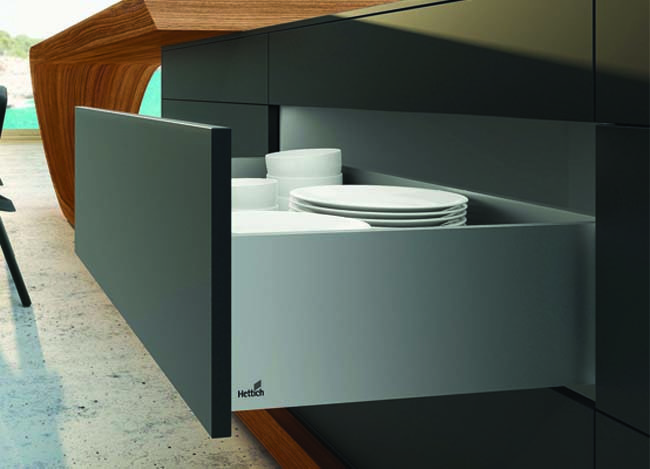 HETTICH’s newest furniture fitting is AvanTech, the thin drawer system which, at just 13mm, is sleek and trendsetting. Breaking tradition, the AvanTech profile uses anodisedaluminium instead of conventional power coated steel. It is fitted with the completely new Actro 5D runner, which can adjusted in five dimensions without tools. Actro 5D is a concealed runner with 80 kg weight carrying capacity, and can also be used for constructing wooden drawers.